Session Initiation Protocol (SIP) is IETF signaling protocol used for VOIP and other text and multimedia communication sessions such as voice and video calls over Internet Protocol (IP). In this overview you can find some information about this protocol. SIP can be used for creating, modifying and terminating two-party (unicast) or multiparty (multicast) sessions. These sessions include Internet telephone calls, multimedia distribution, multimedia conferences, instant messaging, file transfer and online games. SIP is very much like Hypertext Transfer Protocol (HTTP) as it uses similar model to the HTTP request/response transaction model. It employs similar header structure and text-based formats. 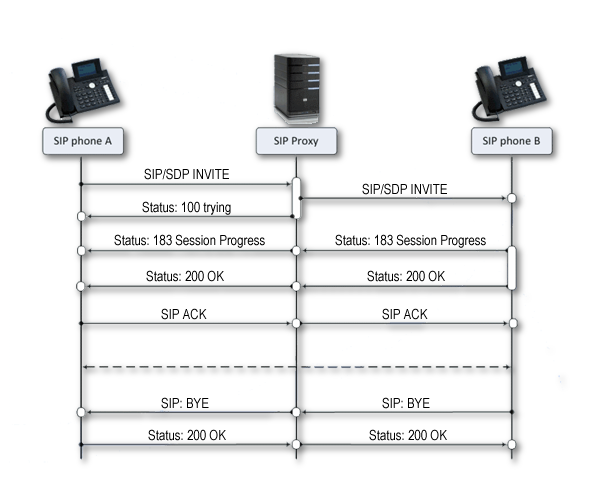 Session Description Protocol (SDP) defines the SIP message bodies for phone calls. In this way SIP transactions consist of a client request that invokes a particular method or function on the server and at least one response. SIP reuses most of the header fields, encoding rules and status codes of HTTP, and providing a readable text-based format. SIP is primarily employed for setting up and tearing down voice or video calls. However, in the process SIP needs to be adopted with other protocols since SIP is only involved in the signaling portion of a communication session. It assists in the connection of communication channels while the factual connection is created by SDP and RTP protocols. Therefore, voice and video stream communications in SIP applications are transmitted with Real-time Transport Protocol (RTP) while parameters like port numbers, protocols, codecs for these media streams are specified and negotiated with the use of Session Description Protocol (SDP). User Agent (UA): It is a local network endpoint that manages SIP sessions. It can function either as a client (User Agent Client) that establishes calls and sends SIP requests; or as a server (User Agent Server) that monitors incoming calls, receives the requests and returns a SIP response. SIP Proxy Server: It is a mediator that functions as a server. Its main role is receiving SIP requests and ensuring that these requests will be handled or forwarded to the user. SIP Redirect Server: It accepts SIP requests, responds to them and transmits these requests to the client. SIP Registrar Server: It accepts registration requests and locates the addresses of clients to the sign-in name or SIP URI of users. Gateways: They control calls and translate formats to other ones. The identification of users in a SIP network is realized with SIP addresses. The format of these SIP addresses is the following: sip:userID@domain.com. If users want to register they need to do so with the help of a registrar server and they also need to use their SIP addresses mentioned above. After this procedure this information will be available for the location server from the registrar server, if it is requested. SIP users are also able to move between end systems since the location server makes it possible to locate the end user by protocols. However, it can occur that users login from more than one station or it is also possible that the location server does not have the accurate information. In these cases more than one address could be returned to the user. If a SIP proxy server mediates the request, all the returned addresses will be tested until the proxy server finds the user. If it is a SIP redirect server, it transmits all the returned addresses to the caller in the contact header field of the invitation response. INVITE It establishes a session between user agents and contains information on calling, called users and media to be exchanged. ACK It is the confirmation of the session establishment. BYE It terminates a session between two users and can be sent by any user. CANCEL It terminates pending requests like an outstanding INVITE. If a session is established it can be terminated by BYE. OPTIONS It requests information about the capabilities about the server, the caller or other devices. With this method media capabilities can be checked before issuing an INVITE. REGISTER It can be used by clients for login and notify its address with a SIP registrar server. SIP responses include a Status Code that is a three digit number and can have values from 100 to 699. Response class is indicated by the first digit of the Status Code. Beside Status Code a Reason Phrase is also included that is the text description of the response. General Headers can be used for both requests and responses and they include basic information such as TO and FROM fields. Request Headers are for request messages and they include SUBJECT and PRIORITY fields. Response Headers used in response messages and provide UNSUPPORTED and RETRY-AFTER fields.